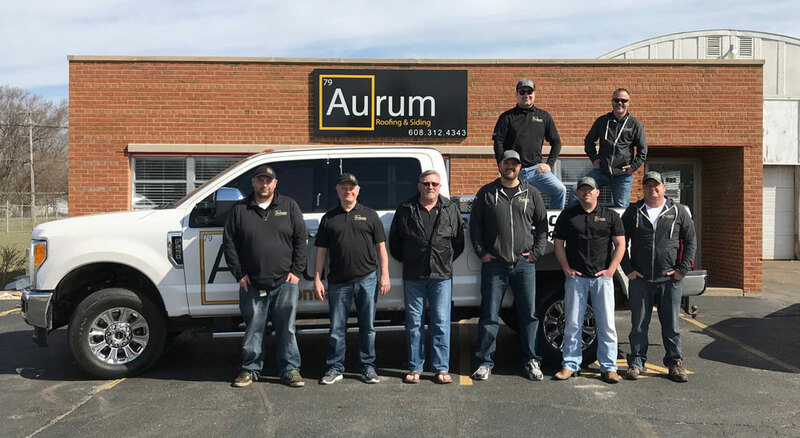 Aurum Contracting stands behind its work so confidently that we offer a full five-year craftsmanship warranty on all of our residential & commercial contracting work. Our warranty is in addition to all manufacturer warranties! Contact us today and we will give you a FAST, FREE, NO OBLIGATION INSPECTION & QUOTE on your next roofing, siding, windows or gutter project! If you are dealing with a residential or commercial hail or storm damage claim, rest assured that we will be your aggressive & experienced advocate to help you get the very most from your insurance claim! Drag center section for a before and after. Online Reviews – What Our Customers Have To Say! Have Aurum Contracting install, repair, or replace your residential or commercial siding. You’ll love the look and results of our hard work. Your professional siding contractor in Beloit, WI! We service a 30+ mile radius offering professional siding services to Southern WI & Northern IL! Replace your residential or commercial roof the fast and affordable way. We use quality materials and get the job done right. Interested in getting either an inspection or a fast free quote on a commercial or residential roof repair or replacement? Ask us about Aurum’s gold standard 5-year craftsman’s warranty! Let Aurum Contracting take care of all your residential window needs. New windows increase your home's efficiency and lower your energy bills. Better windows installed by a professional contractor can save you loads of cash on monthly utility bills! Keep that heat in during the cold winter months and keep the heat out during the summer! Protect your property with professional gutter installation! Gutters are the most underrated protection agent in our industry. Water can destroy your foundation without gutters installed properly by a professonal. We promise to deliver an experience unsurpassed in the contracting industry from initial contact to the finished product. Aurum provides services in Wisconsin, Illinois, Colorado, Nebraska, and Florida. Fill out the form below to receive a price quote from Aurum Contracting. We Are Your Wisconsin & Illinois, Exterior Contractor specializing in residential and commercial: roofs, siding, windows, gutters & storm damage restoration. Aurum Contracting is the Gold Standard in Insurance Restoration & General Construction. We operate according to these core values that continue to raise the bar in the construction industry. Aurum Contracting offers quality service backed by our full five-year craftsman warranty. We stand behind our work and service so much that this warranty is exlusivly offered by Aurum in addition to all manufacturer warranties. You won’t find higher quality standards in the insurance restoration industry than with Aurum Contracting! Each of our crews are tested and tried with our Aurum Quality Control Gaurentee. All of our employees are liscensed and insured to be working in Wisconsin, Nebraska, Florida, Colorado, and Illinois. Need to find a creative solution to working with your insurance adjuster? Aurum Contracting works with you to find the best fit to your project! We deal with the insurance companies for you! Never worry about not having a solution when you hire Aurum Contracting. Aurum Contracting is the Golden Standard in exterior contracting. We are also experts in residential & commercial hail or storm damage restoration. What makes us better than the competition is that we strive for 100% customer satisfaction. This is why we are rated online by our customers as one of the very best residential and commercial exterior construction contractors for the South Wisconsin & North Illinois area. We’ll work directly with your insurance company.